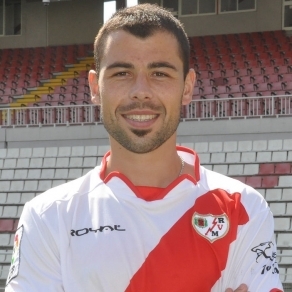 Javi Fuego who currently plays for Rayo Vallecano as a defensive midfielder has signed a contract with Valencia CF that would keep him with the club for 3 years. He will transfer from Rayo Vallecano to Valencia CF in the summer as a free agent. This is the same type of deal as Valencia CF did with Andres Guardado where they reach an agreement with the player and get him on a free transfer in the summer. Javi Fuego is the same as his contract expires this summer and he would simply join Valencia CF as a free agent. I'll list the transfer in the summer and not now, since technically the player still hasn't transferred. Javier 'Javi' Martinez Fuego is 29 years old and has played for Rayo Vallecano since 2010, featuring 68 times for them. So obviously not the most talented of players and certainly not a young prospect. He has played mostly in the second Spanish division. Will this guy be a decent replacement for David Albelda? Certainly not and I don't think he will improve the team one bit. He is a mediocre player that has played mostly in the second division and certainly isn't young to hope he can turn out a huge talent. At best he can provide good cover for whenever the first choice defensive midfielder in injured whoever that may be come the summer.